The Cathedral organ was built by Bevington of London in 1860 and installed in a gallery at the west end of the nave. In 1893, it was moved to its present position above the chancel, and in 1905 “restored and enlarged.” Its last thorough overhaul, which probably included replacing “volunteers” with electricity to pump the bellows, located in the crypt, took place in the 1930s. 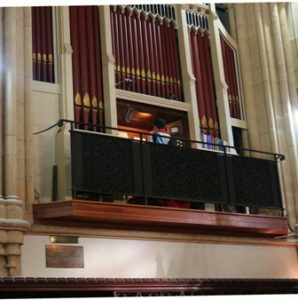 In addition to its regular use in services, including weddings and funerals, and in great diocesan events, the organ has featured in many festivals, choral events and concerts involving the schools and the wider community of Grahamstown. It is much more than an adjunct to worship – it is a precious cultural resource made available to the University, the City and, during the National Arts Festival, visitors from all over the world.